It’s estimated that up to 70% of the population could develop athlete’s foot! Athlete’s Foot is a common skin condition that attacks the soles of the foot and in between the toes. You don’t have to be an athlete to get this condition. Athlete’s foot presents as red, itchy, scaly or cracked peeling skin. It’s caused by a variety of different fungi and thrives in a warm, damp environment. The technical name for the condition is tinea pedis. A common way of catching the fungus is walking barefoot where someone else with athletes foot has walked. So common places to catch athletes foot are gyms, showers, swimming pools and locker rooms. Cornstarch This is such a simple remedy! The neat thing that Claire shares is if you very briefly bake the cornstarch in the oven until it turns light brown, you’ll extract any moisture already in the cornstarch. Then you just rub the cornstarch on your feet and toes and leave it on for 5 to 10 minutes. Claire explains how to take it off. What this does is absorb any moisture on your feet, which removes the damp conditions that athlete’s foot thrives in. The other remedies include lifestyle strategies, different soaks, rinses, cleaning methods, and more. Very helpful article! 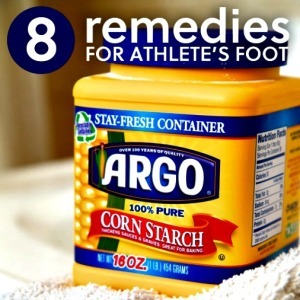 Click on the 8 Remedies for Athlete’s Foot link below to read Claire’s article.